That’s My Jam is a music app. by Interactive Disco that lets you listen to all of your hip new music on a screen that makes it look like you are listening to an old cassette tape. I’m not sure how much one can actually fool themselves into thinking they are listening to “tapes” when the music is coming out of an iPhone or iPod, but who knows. The screen shows a black tape with white details while a song is playing, and it lists the name of the song, artist, time, and track number. The cassette player only has five buttons: Play, Rew, Ffwd, Pause, and Eject. No Stop button, which I find weird. When you press the eject button, the tape lifts out of the frame and reveals the silver inside of a tape player for a moment before going to the playlist screen. 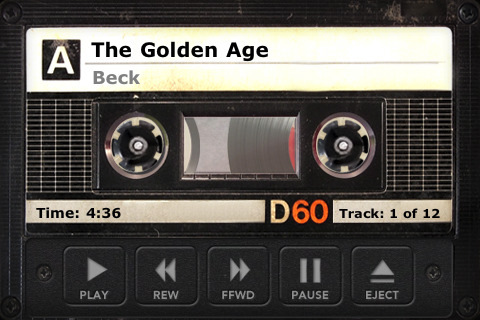 All of the white labels shown in both the playlist screen and the tape screen are discolored, giving the impression that not only are you listening to cassette tapes, but old ones at that. The Rew button only starts the song over, and the Ffwd button only skips to the next song. I really wish that you could hold it down and rewind or skip forward slightly. Also, the reels of the cassette keep spinning even when the music isn’t playing. As someone who once actually did listen to cassette tapes, I just know this to be an inaccurate depiction of the actual functionality of the tape. Also, a couple of times while I was listening to song, the music would stop randomly in the middle of the song, so I had to start it over. That needs to be fixed for sure. If this was a free app., I may understand why people would want it for nostalgia’s sake. But the app. is $0.99, isn’t interesting to look at, and doesn’t function properly. I would way rather listen to my music from the actual music section of my iPod than buy an app. for a buck that is trying to capitalize on the appeal of retro. Please trust me, you can enjoy “your jam” without That’s My Jam. AppSafari review of That’s My Jam was written by Tyne Kennedy on May 13th, 2010 and categorized under App Store, Music. Page viewed 4584 times, 1 so far today. Need help on using these apps? Please read the Help Page.